A security officer stands atop a building overlooking an election rally of Turkey's President Recep Tayyip Erdogan and his ruling Justice and Development Party, or AKP, in Istanbul, Saturday, June 23, 2018. Turkish voters will vote Sunday, June 24, in a historic double election for the presidency and parliament. Turkey is set to go to the polls on Sunday for presidential and parliamentary elections that could pose the greatest electoral challenge President Recep Tayyip Erdogan has faced since coming to power 16 years ago, NBC News reported. It's unlikely Erdogan expected a tight race when he called a snap election in April, hoping to consolidate his rule. But polls suggest outright victory could turn out to be harder than the firebrand president initially wagered. For the first time, Turkey's disparate opposition — made up of secularists, nationalists, Islamists and Kurds — is showing a more united front, with some parties joining forces. Meanwhile the economy, to which Erdogan could once point as a shining example of his success, is looking increasingly shaky. 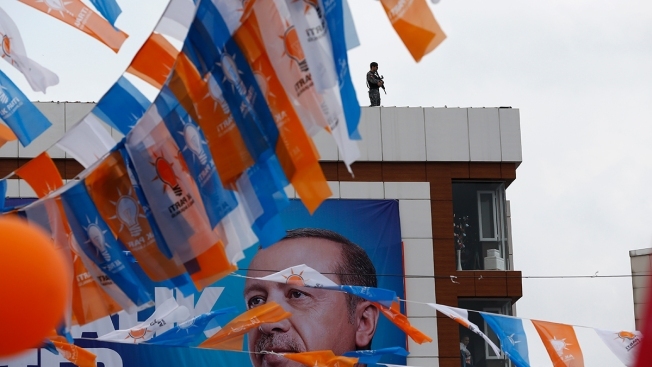 Some polls suggest that while Erdogan is still the most likely to win, he might not manage to muster the more than 50 percent of votes needed to avoid a second round on July 8, while his Justice and Development party, or AKP, could lose its majority in parliament. That could potentially lead to a situation where Erdogan is president but the opposition controls parliament.